Success lies in having the right knowledge at the right time at the right place. The aforementioned saying isn’t actually directly linked with the app I’m covering in this post, but since it sounded nice, I thought to include it anyway so deal with it. Anyhow, those of you who like to take lots of backups of sensitive personal information such as text messages, emails, contacts and, particularly, call logs with the intention that they may come handy later on if you want to prove/verify something will really appreciate CallTrack. Check it out after the jump. Developed by asterdroid mobile, CallTrack is a free Android app [Google Play] which logs all phone activity to your Google Calendar. When you launch the app, you are presented with a simple preferences menu from where you can select things like which type of calls to log – incoming, outgoing, missed – and which calendar to log them to. Once you enable the app from this menu, it will start keeping track of all call activity on your device. Selected kind of calls will be logged to your Google Calendar so that you can view them both online and off. Also, by pressing the Menu button in the preferences page, you have the option to effortlessly sync all current log data to your Calendar. I can see myself using CallTrack’s great logging capabilities to see if a certain person called me on a certain day or not or in case of a dispute with some company etc. ; different people have different uses for call logs. CallTrack is a great app on its own that does what it says. 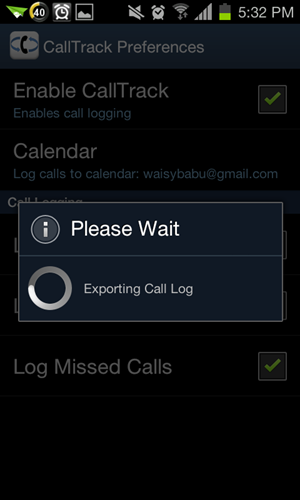 Although not necessary, I think the app can be improved by including an option to record calls to be saved alongside the logs. This would definitely make the logs a whole lot more useful.